In the Pitch Mode workspace or view, the Show/Hide Captions dialog box lets you format text in caption fields. For tasks related to this dialog box, see Customizing Captions. ‣ Pitch Mode Workspace: Select Windows > Workspace > Workspace > Pitch Mode. ‣ Pitch Mode View: Select Windows > Pitch Mode View. The Select Font dialog box opens. Lets you set the style of selected text. Lets you strike out and underline selected text. 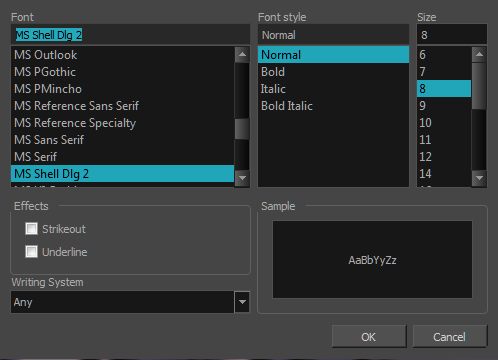 Shows a preview of the selected font and the parameters you set. Changes the selected text to a different writing sytem.